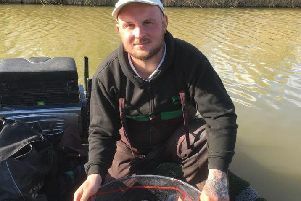 Mark Pollard won the two-day final at Rookery Farm Fishery. I know we anglers do moan about weather conditions all the time but at the weekend, in fact right over the Easter break, I think it’s fair to say they were atrocious. Yet right across the area there were lots of anglers out trying to tempt a few fish into the net. The biggest match of the weekend took place over at Rookery Farm Fishery where all the qualifiers lined the banks of the Magpie Pool for the big £500 two-day grand final. They had just about every type of weather thrown at them yet still battled through to the bitter end. And considering the weather there were some very respectable catches, which is a credit to the fishery and to the quality of the anglers. On the first day it was Tony McGregor taking a very impressive 123lb 14oz to win from peg 38. Runner-up was Ricky Ashwell with 82lb 14oz on peg 25, then came the ever-consistent Mark Pollard with 71lb 2oz. On the second day Pollard stole the show with a match win from peg 32. He put a fine 113lb 4oz to the scales to take overall victory. The back-up weights were very close with Ben Townsend just sneaking second spot with 63lb 3oz from peg 25 followed by Dave Rawlings, who caught on corn tight to the pads for 62lb 12oz. Overall Final Result: 1 Mark Pollard 2pts, 185lb; 2 Ricky Ashwell 3pts, 132lb 14oz; 3 Dave Rawlings 3pts, 106lb 2oz; 4 Tony Dawson 3pts, 100lb 14oz; 5 Tony McGregor 4pts, 176lb 14oz; 6 Martyn Freeman 4pts, 99lb 4oz. The Conservative Club had their second fixture of the year on the Decoy Lakes and despite huge waves pushing along the lake John Hudson did really well to put a match-winning 85lb 7oz to the scales. He caught a few fish on a small Method feeder then switched to the margins taking most of his fish on dead reds. Barry Vernall took the runner-up spot. He caught a mixed bag of carp and barbel on maggot for 58lb 5oz, then came Bob Walker with 44lb 9oz of big barbel on a Method feeder. Webb’s AC fished the in-form North View Fishery on Sunday and the result looks very respectable considering the wet and windy conditions. As expected very few fish came to the pole line, most were caught on small feeder tactics with pellet. Top rod was Alan Forrest with 64lb 9oz. Next came Ray Gregory on 55lb 7oz and then in third place on 29lb 12oz was Gordon Harmer. Yew Lake at Decoy was the venue for the latest Ramsey AS club match which saw some big carp taken and again some impressive weights taken by the leading anglers. Andrew Wilding took the honours from peg 13. He alternated between the pole and small feeder all day with maggot and pellet to finish with 64lb 4oz. Keith Rayment and Des Dalton had to share the runner-up spot, both caught on the feeder finishing with 63lb 8oz. Then came Mick Wright on a level 53lb. This weekend the club have a match on the Willow Pool at Decoy and I hear there are still pegs available.